Sorella's Sarah Krathen breaks down the best holiday bar shopping list. Many casual drinkers don’t keep a fully stocked bar year-round. But with holiday parties in full swing and thirsty houseguests arriving in the coming weeks, a small bar setup is essential. Here, Sarah Krathen, the co-owner and bar manager of New York City’s Sorella and co-author of the new Sorella cookbook, lists the key bottles and mixers to have on hand, and shares festive cocktails to make with them. Rum. Jamaican-made Blackwell or a dark, complex bottling from Rhum J.M. Whiskey. Old Overholt. “It’s a great value that can stand up to a lot of different cocktails,” Krathen says. Gin. Greenhook, a clean and herbaceous American dry gin from Brooklyn. Tequila. Excellia, which is aged in Sauternes wine casks for a smooth, fruity flavor, or Tequila Ocho. Pomegranate juice. This refreshing, sweet-tart juice benefits from its festive red hue. Eggnog. Best to leave the level of spiking to guests. Grapefruit juice. “Citruses are in full swing in the winter,” Krathen says. Grapefruit in particular is terrific with spirits like gin and tequila. Garnishes: Mint, rosemary, orange zest, lemon zest, pomegranate seeds and cinnamon. Other: Mulling spices, simple syrup, lime juice, soda water and Angostura and orange bitters. Eggnog. Krathen likes hers spiked with rum. Variation: Try heating the cream or eggnog mix with a handful of fresh ginger slices before making the cocktail. Hot toddy. Krathen garnishes this hot tea, whiskey and honey cocktail with star anise. Variation: Replace the whiskey with rum and a digestif for a rich, spiced hot drink. Old-Fashioned. Krathen isn’t alone in thinking of an old-fashioned as a fantastic holiday cocktail. Chef Ethan Stowell makes a few every Christmas. Variation: Krathen likes to replace the classic maraschino cherry garnish with house-brandied cherries, pomegranate seeds or citrus zest cut into stars with a cookie cutter. Tequila with lime juice. When approaching an unmanned bar, Krathen’s go-to cocktail is a simple tequila and lime juice. “It’s reliable and delicious,” she says. Variation: Just stir in agave syrup to make a classic margarita. Add pomegranate seeds to make it festive. Gin with grapefruit juice. This bright, fresh combo transforms into a Christmas cocktail with a rosemary garnish. 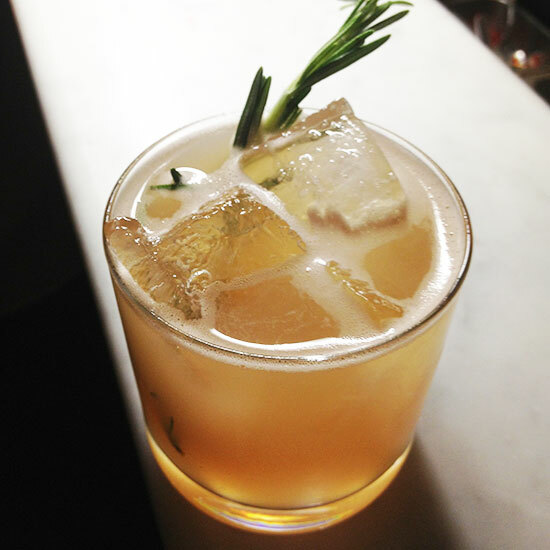 Variation: One of Krathen’s newest cocktails, the Rosemary’s Baby Jesus (recipe below), is a fresh take on this simple drink. Boil peppercorns and orange zest in water for about 10 minutes, just until the peppercorns start to break open. Add sugar while the water is still boiling. Simmer the mixture till reduced, about 10 minutes. Pour into a container and refrigerate overnight. Strain the next day. Shake the gin, juices, syrup and bitters together with ice until cold. Strain into a glass filled with ice. Garnish with a fresh rosemary sprig.